"Stackable Birthstone Rings, Gold Initial Rings for Mom, Set for Two Children"
Create a beautiful stackable birthstone ring set for mom! Two stack birthstone rings and two initial rings make a beautiful piece of birthstone jewelry she will cherish forever. Such a sweet reminder of those you love. 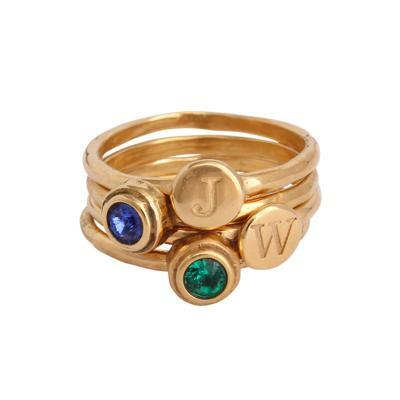 A mother of two will be proud to show off this set of four gold stackable initial and birthstone rings. The stackable mother's rings will represent the two kids initials and birth months as a symbol of the two most important little people in her life. Dimensions: Hammered band is 1/16" thick. Initial plates are approx 1/4" round. Please understand that the bands are separate and stack on top of each other. All rings are gold vermeil (sterling silver with 14k gold overlay). Rings available in all letters and the "&", heart, cross symbols. Birthstones are Swarovski crystals and available in 3mm round, 3mm square and 2mm x 4mm rectangle settings in all birthstone colors (exception: October rectangle not available.) Stones vary in color by shape so please see the color chart for the color of each shape. Please note: Stacking four or more rings will make the ring as a whole feel tighter, so please take that into account and consider ordering a larger size if you plan on stacking 4 or more of these bands.